It doesn't matter what ERP software you're currently using, the data that you've accumulated over time has value. If you've considered an upgrade to Sage ERP 300 (formerly Sage Accpac) from an older ERP system, the more information you are able to transfer over, the better. That's where the Sage ERP Migrator comes in - a data migration tool that simplifies the transfer of historical data. Here's how it works. The Sage ERP Migrator is an easy-to-use data migration tool that simplifies the transfer of data from your old ERP system to Sage 300 ERP. Originally developed in conjunction with the announcement that Sage Pro and Sage PFW would be retired, the Sage ERP Migrator has turned out to be a useful tool in the transfer of historical data from any accounting or ERP system. The Sage ERP Migrator greatly reduces the time it takes to transfer your old data, making the upgrade to Sage 300 ERP smoother and faster than ever - all while preserving historical reports. The migration experts at Equation Technologies can have your new system up and running in no time. No lengthy data conversion or detailed mapping required. How Does Sage ERP Migrator Work? The Sage ERP Migrator tool uses a three-step procedure to prepare your data for migration. Step 1: Data is extracted from the previous ERP system and stored in the Migrator Database. 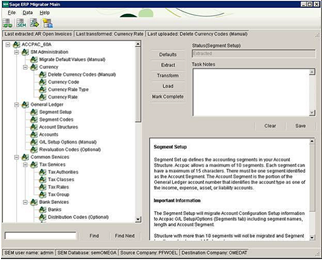 Step 2: The data is transformed into the format that is consistent and compliant with the Sage 300 ERP database. Step 3: The newly formatted data is imported into Sage 300 ERP using a process that ensures complete data integrity. The Sage ERP Migrator tool organizes the migration into separate tasks, which allows you to transfer your entire database at once or in stages. You can even stop and restart the migration at any time to validate or edit information on the fly. What Data Can Be Migrated? Download a copy of the Sage ERP Migrator Factsheet for more information on the data migration process and the benefits of using the migrator to upgrade to Sage 300 ERP. Or contact the Sage 300 ERP migration experts at Equation Technologies to get started.